Julie Made This: What day is it again? I worked through this weekend, upgrading a critical system and staying camped out at my desk for an ungodly number of hours. It was a fraught couple of days, with minor glitches getting in the way of the upgrade, which itself ran through pretty much as planned, but those glitches meant I lost hours sorting them out. So all in all, the weekend was long, stressful and incredibly tiring... The sort of tiring where at the end of the day I can barely string two words together in a coherent fashion. Not good. I'm reliably informed that today is a Tuesday but to be honest I'm beginning to lose track of days. Part of my thinks it is a Wednesday, but I've been warned that Friday could be a long time coming and I have a whole lot more work to get through before then. Having been at the office over the weekend and returning home in a poor state for anything more than eating and sleeping, has meant I'm not really progressing anything at the moment. But... I have been slowly cracking on with my first attempt at a seamed knitted garment, a simple waistcoat (Ravelry Link) from 101 Designer One-Skein Wonders. Here it is as of last Monday, just so you can see what the fabric looks like. This waistcoat is a very simple knit, using something called a mistake rib, which is basically a 2x2 rib knit on an odd number of stitches. 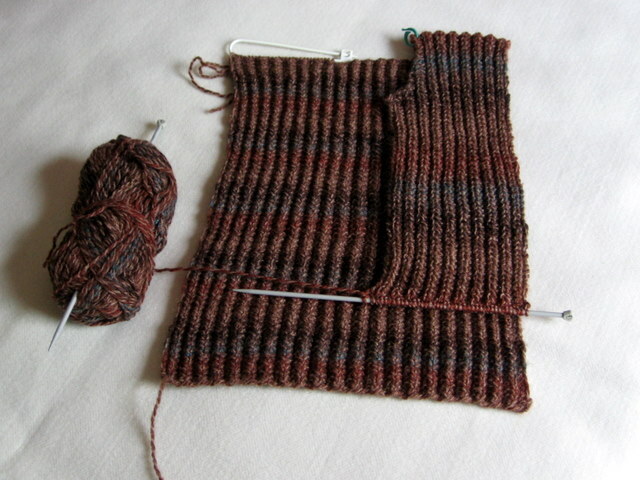 It is very easy and doesn't require much thought, although I have from time to time found myself knitting a proper 2x2 rib as my attention wonders. I finished the knitting part of this on Sunday night and last night, I bravely tackled the side seams using matress stitch. Now, I've used matress stitch before but never on knitted fabric and I thought I did a fairly good job. When I held it up I couldn't see the join unless I used my fingers to feel for it by squeezing the seam, which to me was pretty much the idea. Picture a very happy me. Until I tried the sewn waistcoat on, at which point it appeared to be far too small for me. I'm considering this a learning experience. No finished pictures as of yet, because I'm concentrating on trying to sort it out rather than waiting for good light and photo opportunities. Sounds like you need some small friends who would appreciate a gift that if your crochet doesn't solve the problem. Sizing knitwear seems to be a difficult task with pattern books not really getting it right, although off the peg cloths seem to have just as many problems with sizes.